Much cloudier than yesterday, but still warm. Butterfly activity was reduced. I saw a couple of Large Whites and a female Brimstone at the allotment, and one female and two male Orange-tips, several Holly Blues and a Small White in the garden. Rather more cloud than yesterday, but it was still warm. I visited Hackpen Hill and made the descent to the Devil's Punchbowl. There were several Skylarks singing, and at one point there were four Red Kites and three Buzzards over the valley. The punchbowl was quite sheltered compared to Crowthorne Bottom. Eventually I spotted two Green Hairstreaks sparring over an elder bush. They were unwilling to settle on lower vegetation. 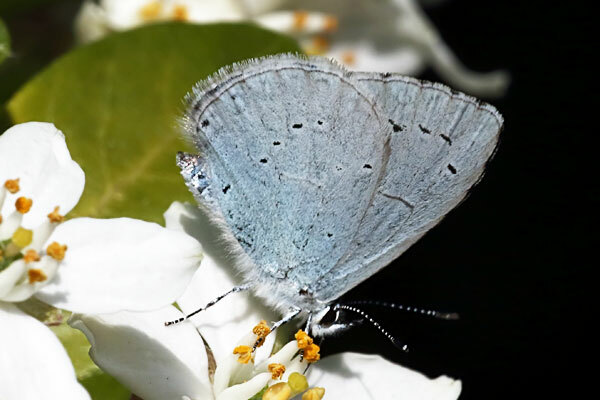 I was surprised to see a Holly Blue fly in - they seem to be everywhere this spring! 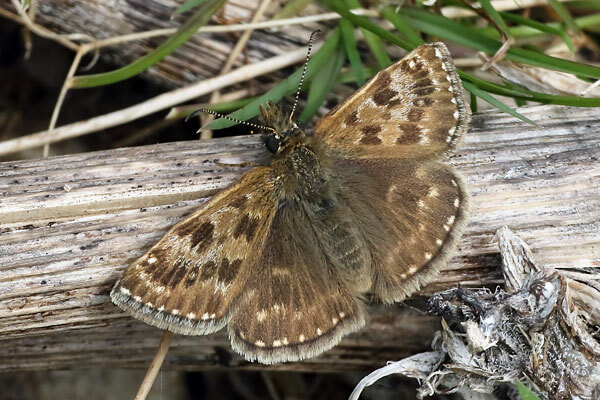 While waiting for the hairstreaks, I found a Ruby Tiger, a Common Carpet and several Wavy-barred Sable moths. 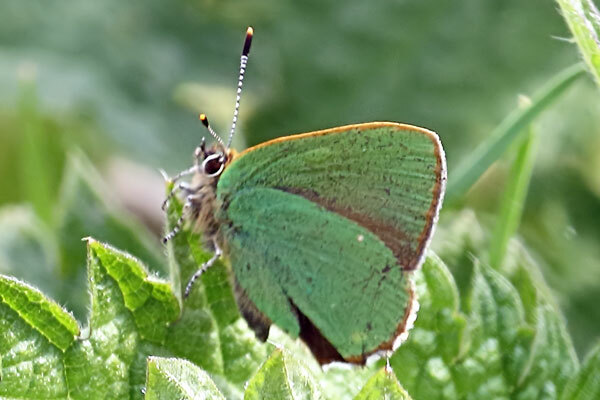 As it became warmer, more Green Hairstreaks appeared - about seven in total. 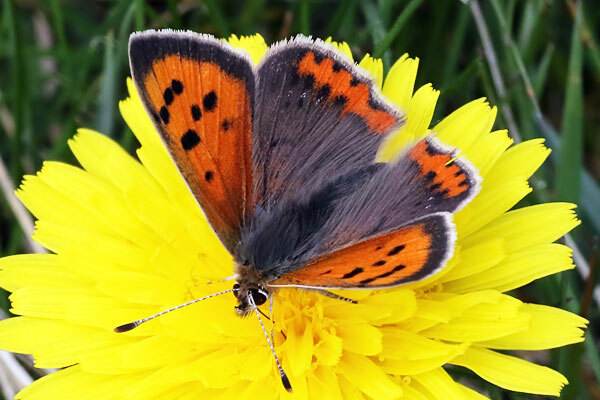 I then found a Dingy Skipper and a Small Copper, both looking pristine. On the way back up the slope I rescued a Small Tortoiseshell from a spider's web. There were a few Peacocks about as well. 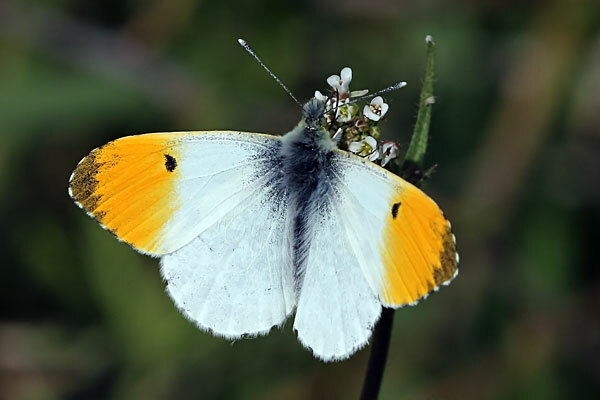 In the garden in the afternoon I saw several Orange-tips and Holly Blues. The Orange-tips showed a distinct preference for Honesty, ignoring the adjacent 'Bowles Purple' perennial wallflowers. For the first time I saw two Holly Blues at once around the ivy, but it is impossible to be sure how many different individuals I saw. A Small White turned up for nectar late in the afternoon. I made an earlier than usual start today, getting to Farmoor just before 9am. This was just as well, because I had just started walking across the causeway when suddenly there were lots of Little Gulls overhead, calling as they headed north. I counted about thirty, but there were probably more. As I got nearer the river I heard a Cuckoo, but failed to find it. South of Shrike Meadow I saw a Cetti's Warbler, three Willow Warblers, two Sedge Warblers and three Whitethroat. I also heard Chiffchaff and Blackcap. 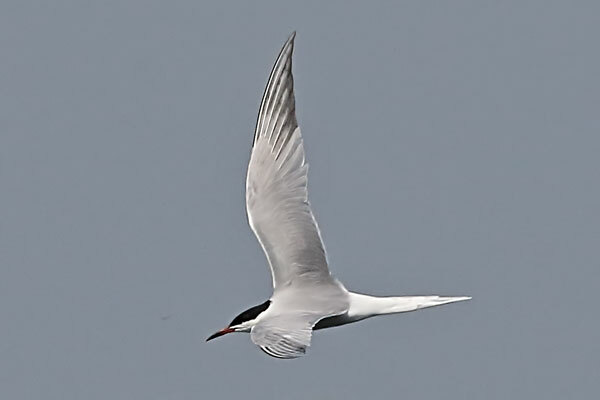 There wasn't much of note until I got back to the causeway, where a large flock of terns was flying low over F2. On closer inspection a lot of them proved to be Arctic Terns. 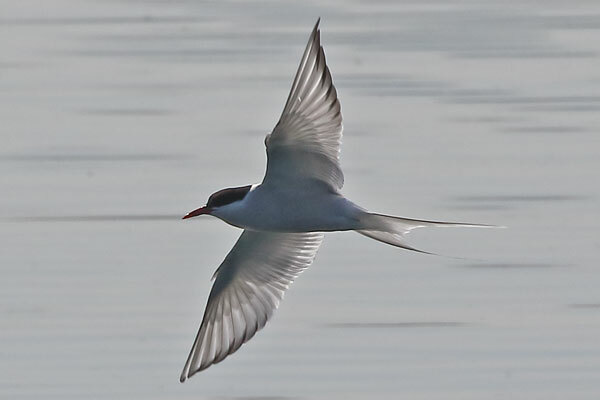 There were at least thirty birds, with around ten or so Common Terns, and a single Black Tern (confirmed later). 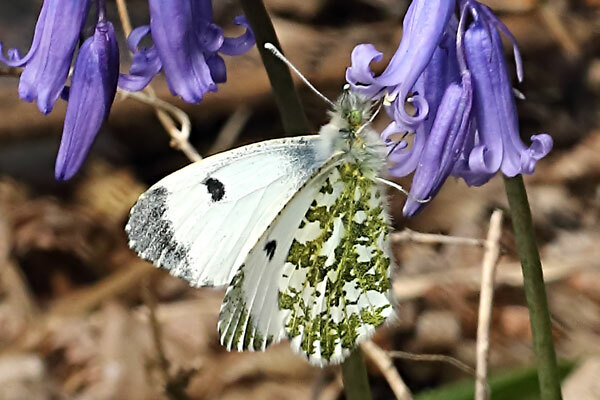 Butterflies seen today were Orange-tip, Brimstone, Peacock and Speckled Wood at Farmoor, and Orange-tip, Peacock and Holly Blue in the garden. Another warm and sunny day. In the morning I had a walk in Bagley Wood, mainly for the bluebells (which were not fully out, but still worth a visit). Species of the day was the Speckled Wood - I saw at least fifteen, including a group of four sparring with each other. Other species were Peacock (7) and Orange-tip (6 males, 1 female). 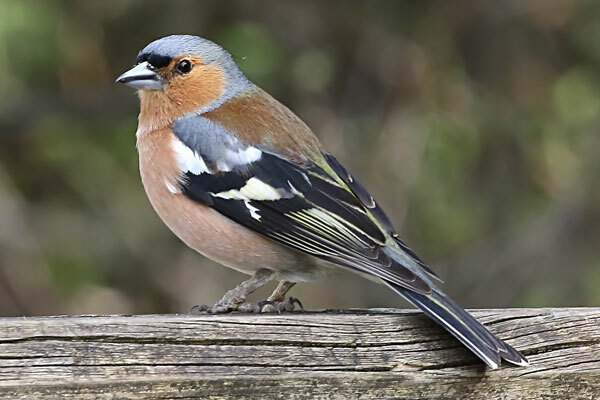 Birds of note were a pair of Goldcrests and a Nuthatch. I also saw a female Roe Deer. I then went to Dry Sandford Pit, where I saw Blackcap, Chiffchaff, Jay and Treecreeper, and heard Willow Warbler and Sedge Warbler. 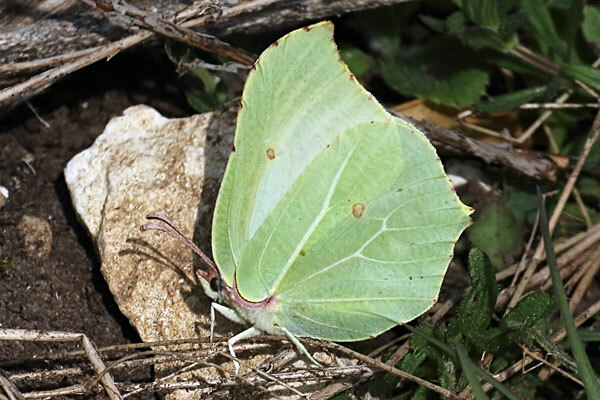 Butterflies were the same as seen in Bagley Wood, with the addition of five Brimstones and a female Holly Blue. 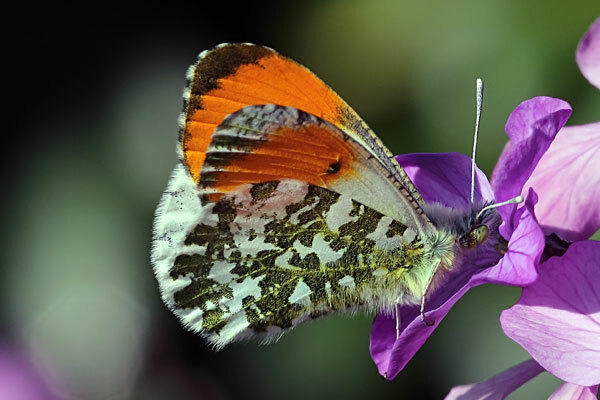 In the garden in the afternoon there was a steady stream of male Orange-tips taking nectar from Honesty flowers (there were at least two different individuals, probably more). 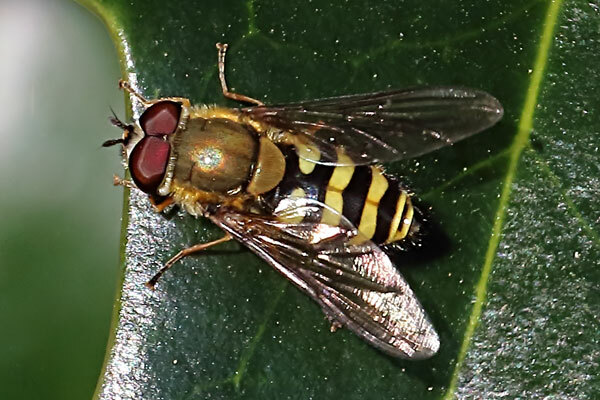 Two females were observed laying eggs on Honesty. A female Brimstone also took Honesty nectar. There were also several Holly Blue sightings, and late in the afternoon a Speckled Wood paid a brief visit. Sunshine from the off today. A brief stop at the allotment produced a single Small Tortoiseshell. I then headed to Aston Upthorpe Downs. I saw a Small Tortoiseshell, a Peacock and an Orange-tip in the scrubby ground between the grain drier and the start of the SSSI. More butterflies took a while to appear. In the meantime I flushed a pair of Red-legged Partridges. Several Blackcaps and Chiffchaffs were singing. 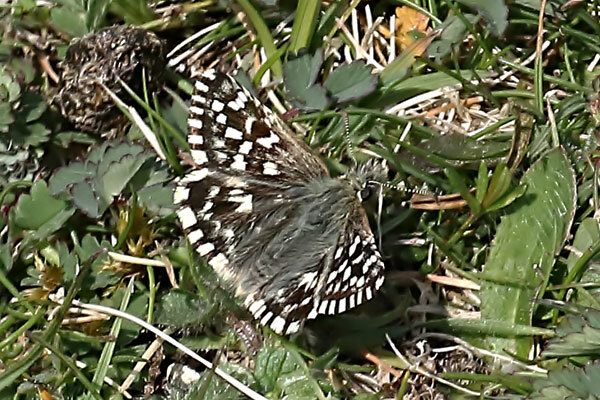 In Juniper Valley I was about to give up on seeing any Grizzled Skippers when one landed almost at my feet! I managed a quick record shot before it disappeared. I walked up to the dew pond, seeing quite a few Brimstones on the way (I saw about 40 altogether), as well as a new moth for me, a Straw-barred Pearl. I saw a Holly Blue as I walked back through the SSSI. At home, Holly Blues kept appearing all afternoon (presumably different individuals, but it's impossible to be sure). One took some nectar from Choisia flowers, so I was able to get a photo. 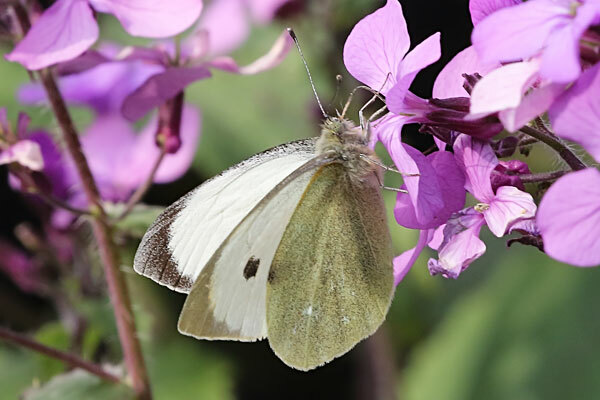 As yesterday, three male and two female Orange-tips, and a male Small White, turned up to take nectar from Honesty flowers. A rather tatty Peacock made a brief appearance on the Choysia. Again rather misty this morning, but by the afternoon it was warmer than yesterday. I visited Otmoor today. When I got there the sun hadn't come through, and I only found one Speckled Wood along the old roman road. But there were Blackcaps, Chiffchaffs and Willow Warblers singing. Up on the bridleway I saw a Skylark above Greenaways. I then heard a Cuckoo, but couldn't locate it. It was warmer by now - Orange-tips started to appear, and Sedge Warblers started singing. I saw two Marsh Harriers. Several Cetti's Warblers were calling, and I spotted one on the way to the first screen. There were about eight Common Lizards sunning themselves in the lizard lounge. 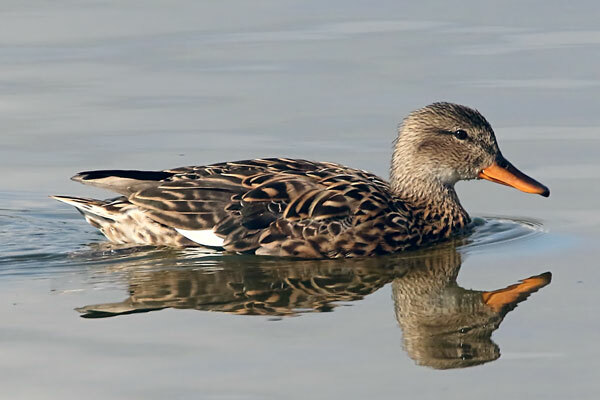 The usual ducks were on the lagoon, but numbers were much reduced. 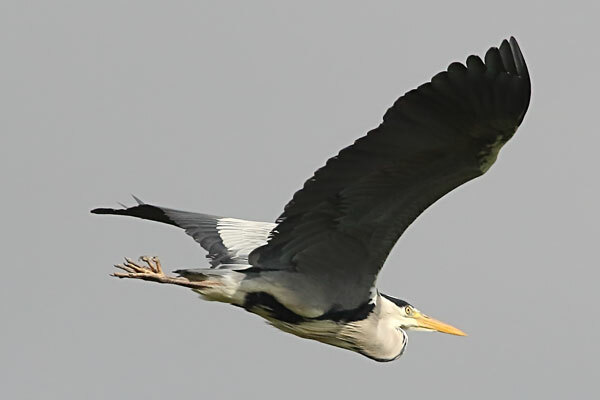 I spotted a Bittern flying above the reedbed, but it was too far away to photograph. On the way back to the hide I saw a Cuckoo flying out of the oak tree on the track. I spotted a Grass Snake swimming in the ditch by the gate. There were two Oystercatchers on Ashgrave, and three Redshank on The Closes. 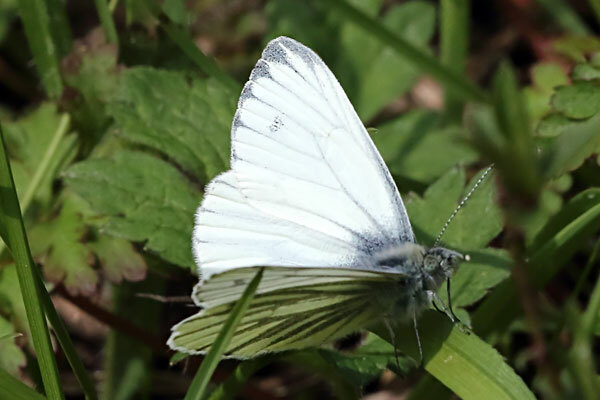 The bridleway was a bit exposed to the wind, so I didn't see more butterflies until I got back to the roman road, but there I found more Orange-tips, several Brimstones, a Green-veined White and a Comma. After lunch I went into Long Meadow. There was no sign of any Redstarts, but I saw a Willow Warbler, a Kestrel and two pairs of Yellowhammers. I watched a female Brimstone laying eggs. I then walked back along the roman road, where there were more Peacocks, Commas and Orange-tips. In Saunders Field I saw a pair of Red-legged Partridges and another Marsh Harrier. Back at home three male Orange-tips and a male Large White came to take nectar from Honesty flowers, and two male Holly Blues were flying around my Ivy bush. A bit misty this morning, but once that cleared it became quite warm. I went over to Farmoor. There were a few Little Gulls when I arrived, but they didn't stay long. There were no hirundines about other than a couple of Swallows. The Snow Geese were still down at the south end of F2. A male Sparrowhawk had been found sitting under the wave wall. 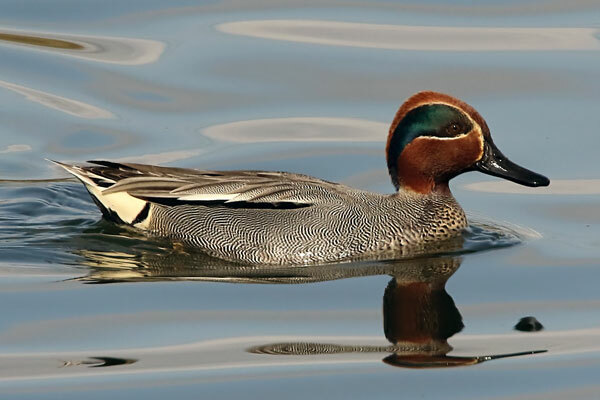 I saw it flew very fast and low along the water's edge, but it didn't catch anything. Down at Pinkhill there were singing Chiffchaffs, Willow Warblers and Blackcaps. I heard a Cetti's Warbler and my first Sedge Warbler of the year. A male Orange-tip was active near the river. 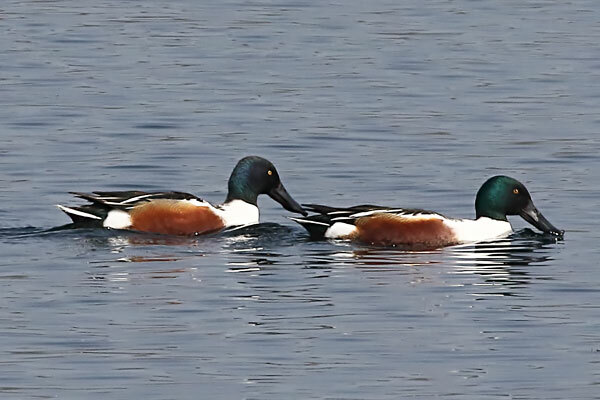 On the way back across the causeway I saw a trio of male Shoveler on F1 (not a common bird at Farmoor), and three or four Common Terns on F2. 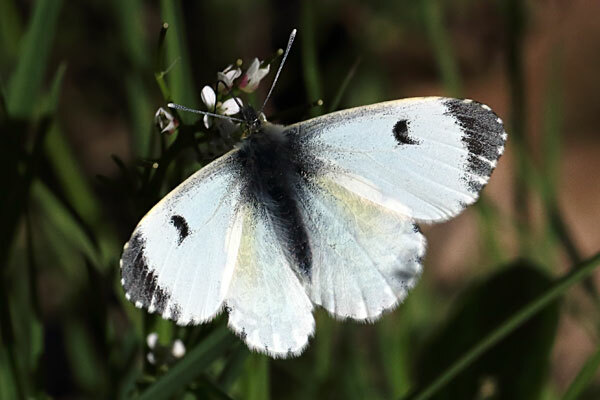 In the garden I saw two Holly Blues, then at the allotment I saw around ten Orange-tips, at least four Small Whites, two Large Whites (first of the year), two Brimstones and three Peacocks. 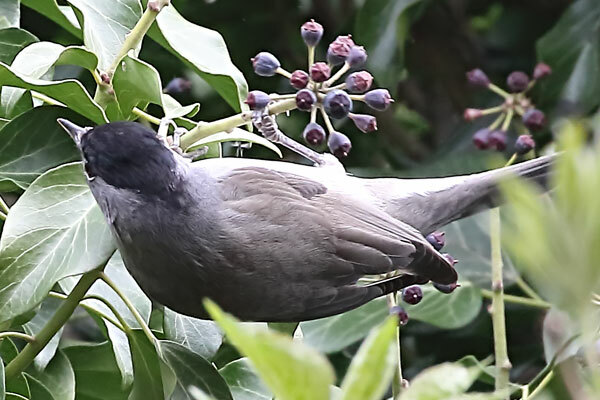 The Blackcap was still singing from deep within the A34 embankment scrub. Rather cloudy this morning, but warmer than recently. After lunch there was hazy sunshine, and a male Orange-tip flew through the garden. I quickly headed up to Bagley Wood. There were quite a few butterflies along the road verge and the area on the other side of the hedge (at about SP509014). Most were male Orange-tips (at least 15). 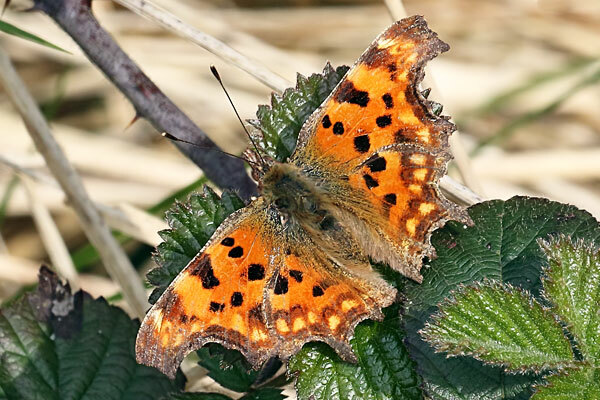 There were also three female OTs, a Comma, five Peacocks and two male Brimstones. A walk in the west wood didn't turn up any butterflies, but I saw a Green Woodpecker and a Great Spotted Woodpecker, and heard a Blackcap. Two Buzzards were high overhead. Another sunny but cold morning. I headed over to Standlake Common. There were quite a few Chiffchaffs and Blackcaps singing everywhere. A Greenfinch was singing near the 3Ts lake. The usual species were on pit 60. Around fifty Sand Martins and two Swallows were feeding low over the water. 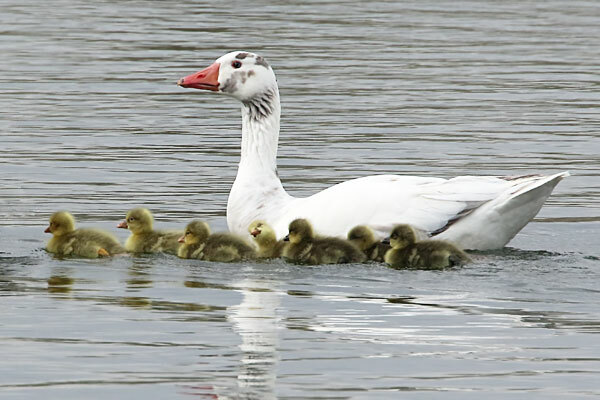 I saw my first juvenile birds of the year - seven goslings, which were fiercely defended by their feral Greylag Goose parents. A Little Ringed Plover kept taking to the air from the island and flying an intricate pattern. This was clearly to impress a female bird (which mostly stayed on the ground). It must have worked because the pair eventually copulated. The other noteworthy bird was a Green Sandpiper, my first of the year. I also saw a Willow Warbler near the feeders. A pretty chilly morning. I went over to Aston Rowant NNR. On the way to Linky Down I heard a Chiffchaff and saw another. After 30 minutes I'd seen no Ring Ouzels, but when I moved down the slope a bit there were two males perched in a tree! 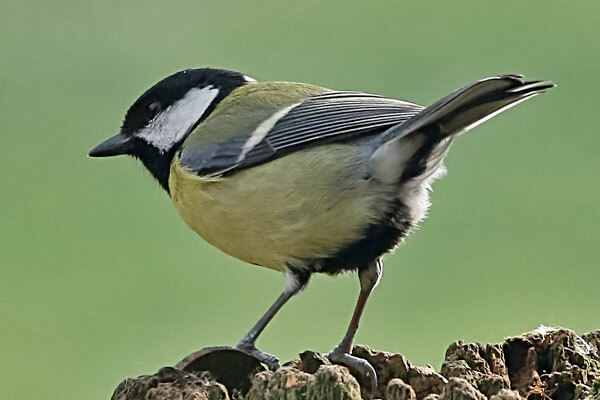 They flew to a Juniper bush at the bottom of the valley, where they continued to show for another half an hour. 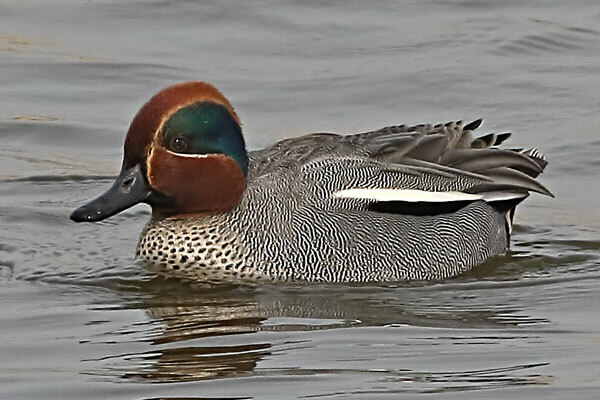 There were definitely three males and one female, but there might have been more. On the way back to the car I saw three Jays and two Linnets. At home, the pair of Blackbirds have been taking food back to the nest, so their eggs must have hatched. 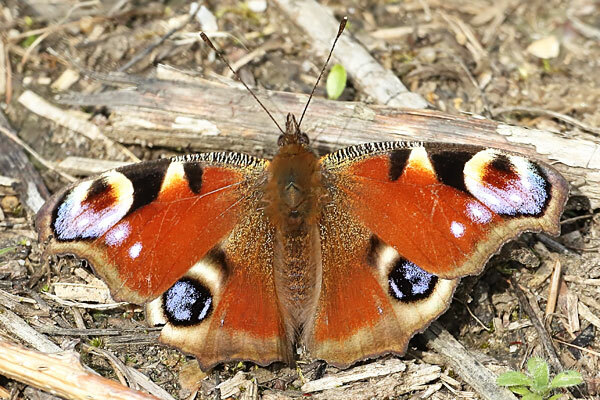 At the allotment this morning I saw a Peacock (first butterfly since 1st April), a male Blackcap singing in the scrub on the A34 embankment, and a Buzzard. 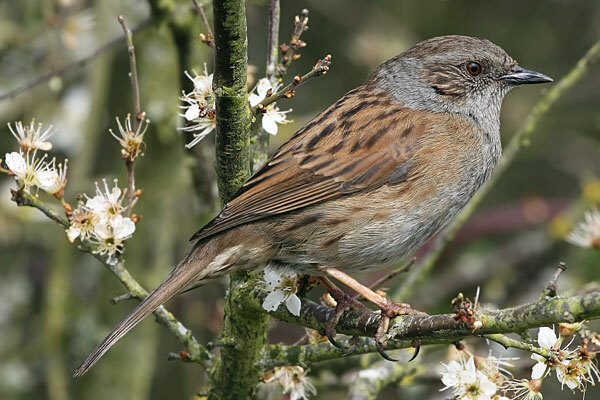 In the garden I saw a male and a female Blackcap. Very different weather today - mostly sunny, a brisk ENE wind and about 8°C. When I got to Farmoor at 09:30 there were again hundreds of Sand Martins flying low over both reservoirs. 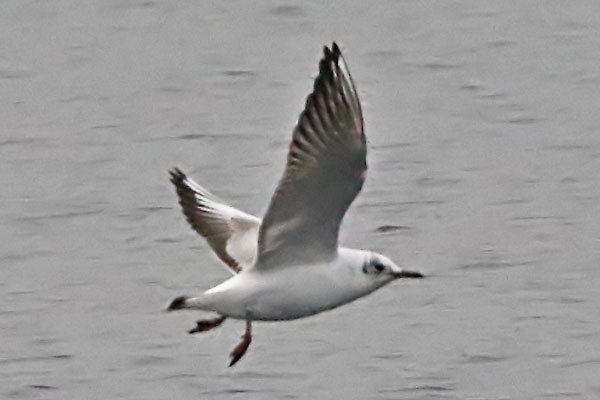 Seven Little Gulls were feeding well out on F2. 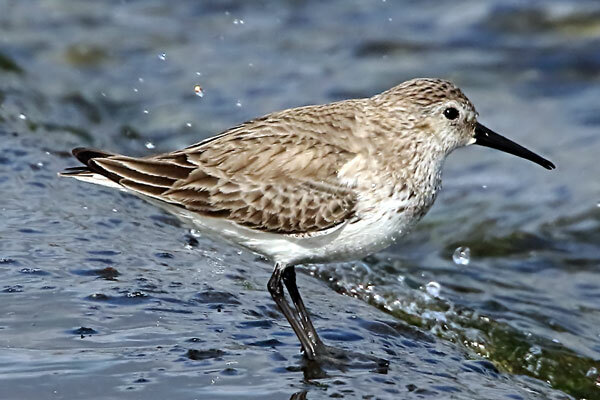 There were two Dunlin on the causeway - the first I'd seen at Farmoor this year. 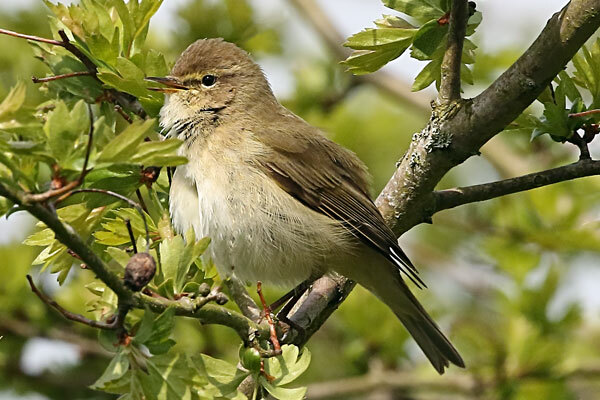 At Pinkhill I heard Chiffchaff, Willow Warbler, Blackcap and Cetti's Warbler. On the way back to the car I saw at least three Common Terns on F2 (first of year). There was no sign of the Snow Goose flock today. A very misty and murky day. I visited Farmoor in the late afternoon. 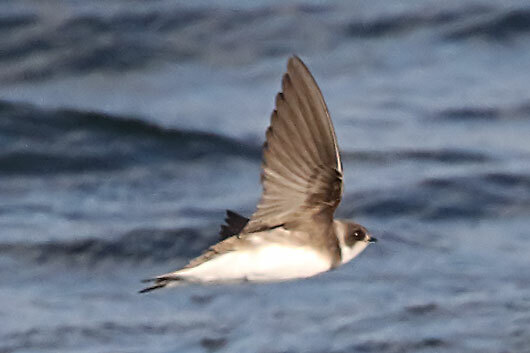 When I arrived there were hundreds of Sand Martins flying low over both reservoirs. I'd been told that there were some Little Gulls about, and I found them feeding on insects on F2. There were lots of Pied Wagtails on the causeway, along with some White Wagtails, and individuals which looked to be intermediate between the two. 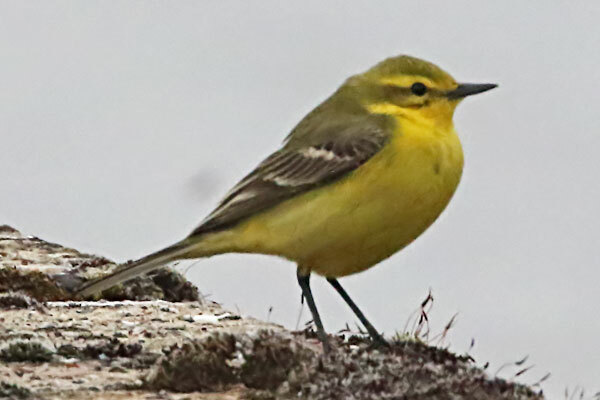 Four Yellow Wagtails provided a welcome splash of colour on a grey day. The blue-headed "Channel wagtail" was among them. I spotted a Common Gull sitting on a buoy on F1. The Snow Geese took off from the south of F2, flew north, and then returned after 10 or 15 minutes to the same spot they'd started from. It would be interesting to know why! 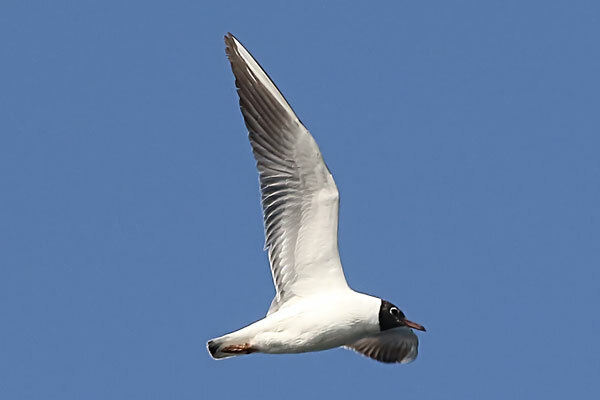 The Little Gulls were last seen high up, heading north. A very chilly start, but the sun did make an appearance. I headed over to Standlake Common. On the way to the Langley Lane hide I heard a couple of Chiffchaffs and a Blackcap. There were many Sand Martins and a couple of Swallows flying low over the water at pit 60, but they didn't stay around for long. 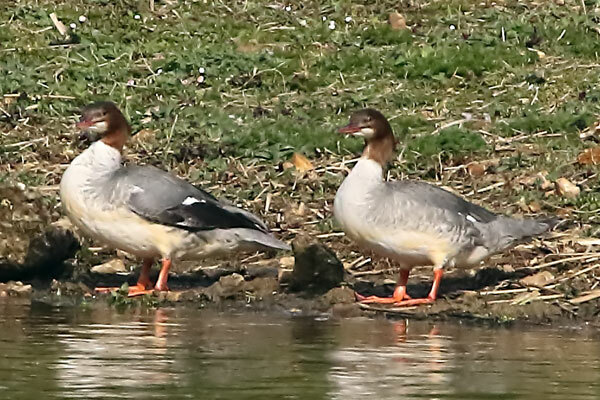 A couple of redhead Goosander hauled themselves out of the water and went to sleep on the shore. A pair of Oystercatchers were on the north shore. 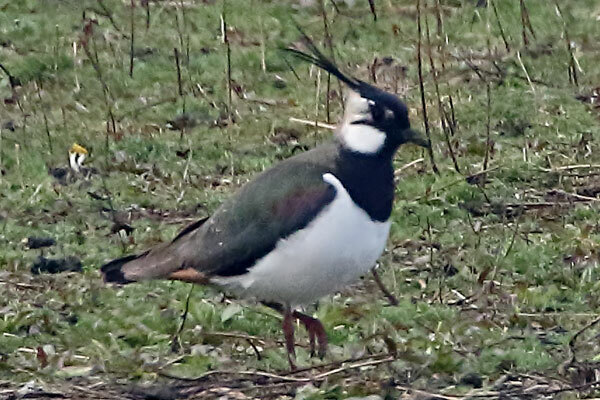 There were six or seven Lapwings about, but no other waders. 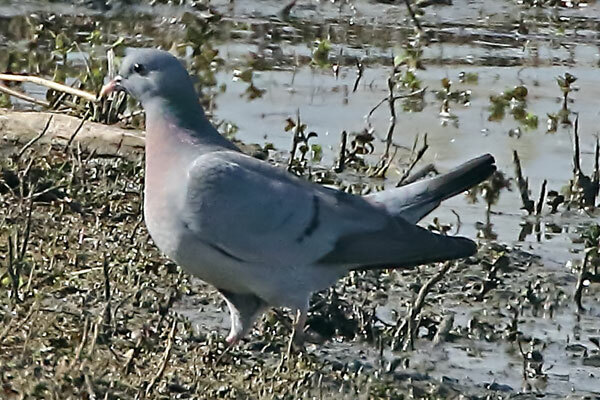 A Stock Dove landed on the eastern shore not too far from the hide. 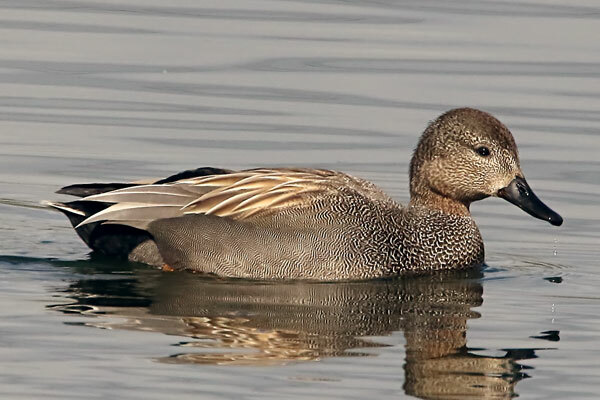 A pair of Gadwall and three Teal were feeding in the shallows. 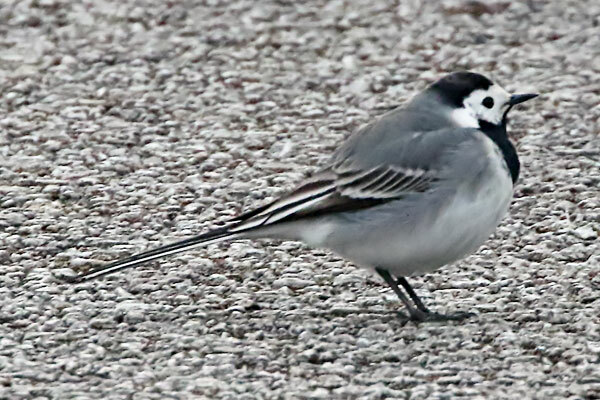 I spotted a White Wagtail on the island. On the way back to the car I heard and then saw my first Willow Warbler of the year. Today was quite chilly to start with, but it warmed up as the day went on. I had a walk around the Oxford University Parks with my friend from Edinburgh. We heard a Nuthatch calling, but couldn't locate it. 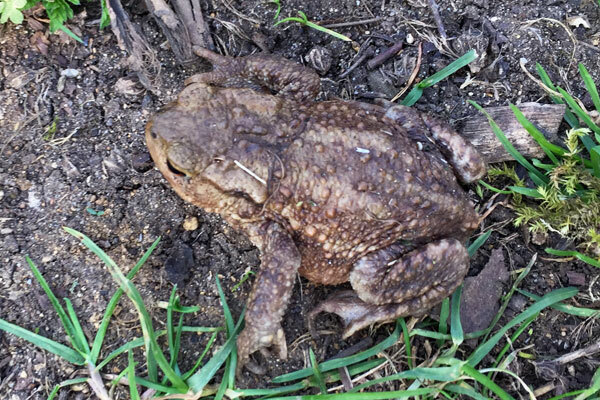 I then spotted a Common Toad crossing the path, and the first Orange-tip of the day. We crossed the bridge into Marston Meadows, where I saw a female Blackcap, a Treecreeper and a female Ring-necked Parakeet. 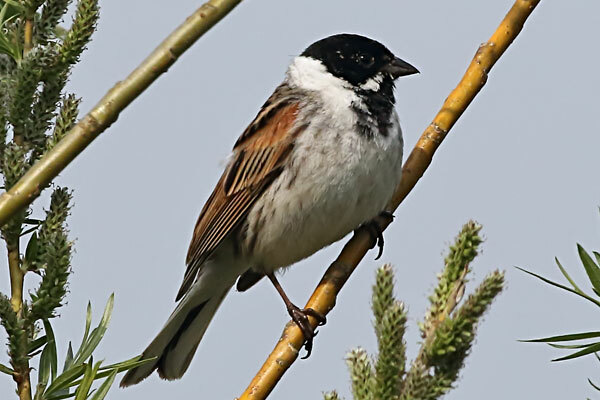 The latter showed quite well for a minute or two before disappearing into a hole in one of the willow trees. Back in the Parks we found a couple of Chiffchaffs, a Peacock and a Speckled Wood. After lunch we went to Magdalen College to see the Snakes-head Fritillaries, which were out in profusion. While there we saw a pair of Nuthatches; one seemed to be excavating a nest hole. I also saw another Treecreeper. The most surprising sighting was of a pair of Ravens which were soaring quite high up (probably over Marston Meadows), but their wedge-shaped tails were clearly visible through binoculars. We also saw at least four Orange-tips.